One of the five names of Pharao, which were lent to him with its coronation, is the nebti name. in each case on the " Neb " - sign (Gardiner: V30). Does someone know perhaps further examples of this kind (animal and crown in combination) ? Gratefully for each reference ! I believe this was Tutankhamen's protection. 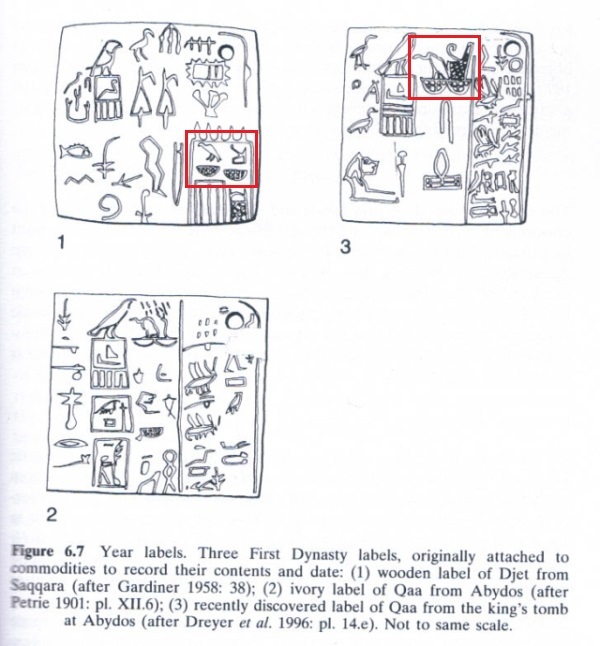 I have heard various interpretations of the symbols, as there is no writing it is hard to know what it was used for exactly, unless it was written about, but we can see that each animal is wearing a crown. I don't think this pertains to predynastic Egypt, but that wasn't specified if that was what you were looking for. Hope this helps. It was about a very special part from the royal titulatur, the so-called "Five Great Names". To be precise, about the so-called "Two Mistresses" or "Nebty" name. This name begins with / is introduced by vulture and snake on a baskets, or by white and red crown on a baskets. In both cases it is a symbol for the two countrys or also the crown goddesses, Nechbet (Upper-) and Wadjet (Lower-Egypt).